Sixt - Olympia, WA. Perfect for the PNW Winter Riding "If your a two wheel single track addict that wont let a little rain, snow, or 30° ride temps stop you from your brap, this is the set to get. I've had to open vents to cool off in 36° runs, so it's probably going to be too warm above 45 or 50° It's totally waterproof, found a submerged root in flooded out double track and landed in about 12" standing water then slid to "dry" ground. Only exterior got wet and rode another four hours with no problems. Goes well with the factory TE250i graphics. Got the XL to wear armor underneath. 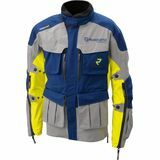 If you don't ride a Husky you can still wear it, we'll understand..."
tsa250 - Albuquerque Great "I'm 6'0" and 190 lbs. The Large fits me great. The sleeves run long but I appreciate that when I'm on the bike. The vents are awesome once you are moving. The worse the weather gets, the more I appreciate the Traverse. 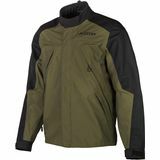 As with all KLIM gear, it is built tough and durable."